When viewed from Tucson, Tanque Verde Peak is the right side of the huge mass to the east of Tucson. It has a very obvious, long, gradual ridge that leads up from the right. At 7,049′, Tanque Verde Peak is the lowest of the three mountains in the Rincon Range – Mica Mountain to its left is 8,666′, and behind it, Rincon is 8,482′. 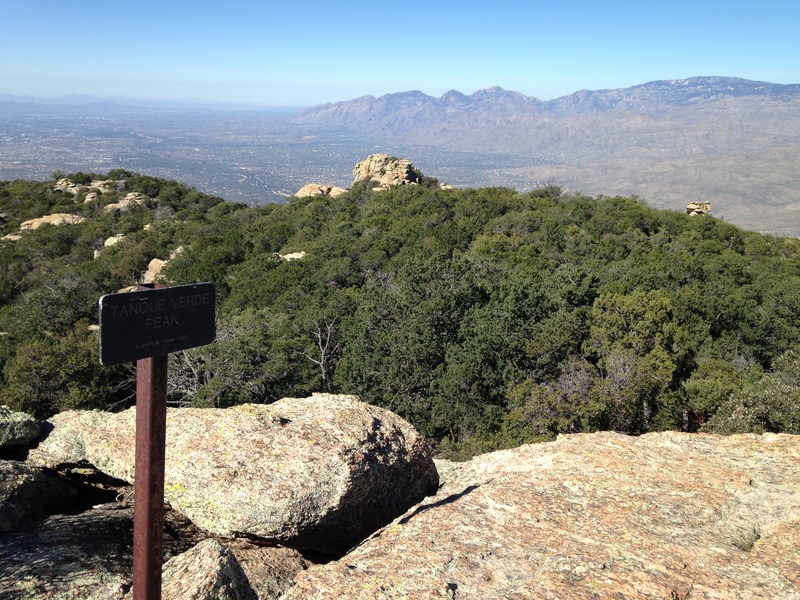 The standard way to climb the peak is the 9 mile hike up Tanque Verde Ridge, starting in Saguaro National Park. Drive east and south out of Tucson to Saguaro National Park. After the pay station, turn right along the 2-way road. Follow this to its end at the Javelina Picnic Area, and the Tanque Verde Ridge trailhead. The trailhead is on the right just as you enter the picnic area loop. When I hiked this in November, 2015, the signs said that Saguaro National Park opens at 7 am and closes at sunset. It’s an 18 mile hike to the top of the peak and back, so time your trip appropriately. Tanque Verde Ridge is a pretty hike with some lovely views. It’s a more interesting hike than Mica Mountain, but not nearly as dramatic and spectacular as Rincon. After you reach the ridge line, the trail skirts most of the bumps in the ridge, keeping the hike from being very steep. There are a few short downhill sections, but mostly you are climbing gradually up the ridge. While the trail is mostly obvious, at times it’s less clear and you need to pay attention to the frequent cairns that mark the way. Sometimes the trail is subtle enough that it’s worth looking back to make sure you will be able to find the trail on the way back down. After 6.9 miles you reach the Juniper Basin Campground. From here it’s only another 2.1 miles to the top of the peak. This section initially takes you away from the ridge line and you can see lovely cliffs on the ridge as you look to the left. You may wonder if you are on the correct trail – you are, and eventually it will take you more leftwards towards the final cliffs near the summit. The summit register is just below the final summit block. When I was there, there was no pen or pencil, so if you like to sign summit registers, bring your own pen and paper. A short scramble takes you to the summit sign and lovely views. I hiked this on 11/13/2015.